"We need your help to stand up to the powerful forces trying to block our recount campaign for citizen democracy," Stein’s fundraising page states. "We received word yesterday that the final estimate for the filing fee for the recount in Wisconsin is $3.5 million—an outrageous cost increase from the initial estimate of $1.1 million that was given to us by WI state elections officials based on the last statewide recount. But thanks to over 130,000 small donors like you, we have enough money in hand to pay this fee and move forward with the recount!" "But because of this exorbitant fee increase—bringing the total money required for recounts in all three states to $9.5 million—we need your help. We’re not there yet, and we need every last penny to reach the $9.5 million benchmark." The fundraising page put the Pennsylvania filing fee at $500,000. Michigan’s fees were pegged at $975,000, according to the website, bringing the total amount in filing fees to $5 million. The estimated attorney fees for the effort also jumped as the fundraising goal increased. Stein first sought $1 million for the costs of attorneys. Stein now claims attorney fees will run between $2 and 3 million. The filing fees combined with the costs of attorneys in the three states brings the maximum overall estimated amount to $7.9 million. Stein has raised $6.8 million for the attempted recounts over the course of the past week. This is more than twice the amount that Stein’s campaign hauled in throughout the entire 2016 election cycle. 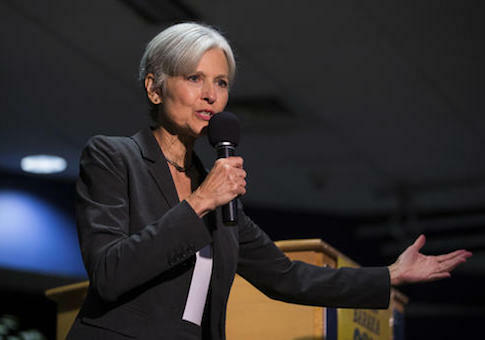 Stein has said that excess funds would go toward "election integrity efforts" and to promote "voting system reform." "Marc is very skilled at finding deep pockets to pay for his pet projects, no matter how much merit they may have or not have," J. Christian Adams, president and lead counsel at the Public Interest Legal Foundation, said. "George Soros funded some of his failed voter ID efforts. I’m sure he’ll find another sucker." Elias has said that the Clinton campaign did not find evidence of hacking of voting machines in any of the targeted states after conducting an internal investigation. Despite no emerging evidence of hacking or tampering, Elias is participating in Stein’s recount efforts. Clinton’s campaign is also looking for volunteers to help, the New York Post reports. President-elect Donald Trump has called the fundraising effort a "scam" while Rep. Paul Ryan (R., Wisc.) has referred to it as a "ridiculous fundraising and publicity stunt." Stein’s campaign did not return a request for comment.